The Peak-to-Correlation Energy (PCE) is a much more robust correlation measure than Pearson Correlation and provides output values spanning a more intuitive range. For non-matching images, the PCE usually takes values in the range [0 25], while for matching images the common range is [45 105]. 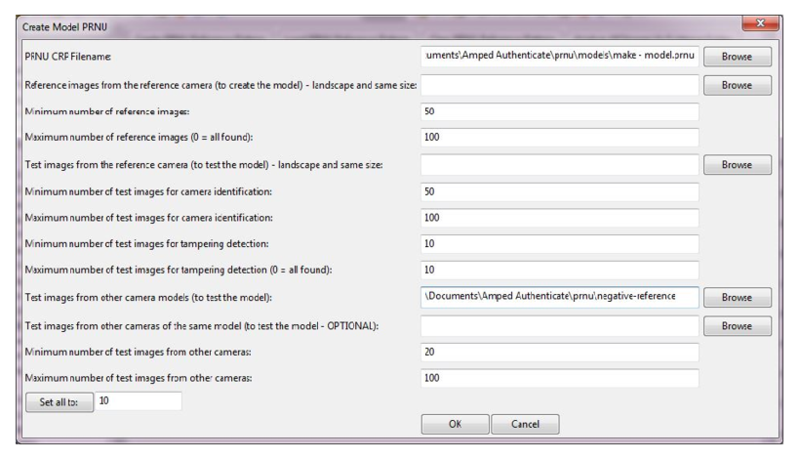 In older versions of Amped Authenticate, the user had to specify several folders in order to create a new reference pattern, because the compatibility threshold changed significantly across different cameras. Since PCE values tend to span the same range across all devices, we removed adaptive threshold computation and suggest a fixed threshold (we will see the experimental validation in a future post). Now the user is only asked to specify the name of the CRP file to be created and the folder where reference images are stored. Amped Authenticate will automatically triage images in the folder and choose the best images for computing the CRP (the number of images is limited to 50, which proved to be enough – we’ll also discuss this in a future post). After computing a new CRP, the new version of the filter stores all information in a single .crp file. In the same folder, a text file (.crp.log) containing information about CRP creation process will also be available (e.g., list of images used for CRP estimation). This favors reproducibility of the process, which is fundamental in every forensic application. The PCE allows matching images even when an arbitrary number of rows and columns have been removed, provided that no resizing occurred before or after cropping. Robustness to cropping and resize has been extended to the case of rigid rotations of the image. Amped Authenticate automatically checks whether the evidence image needs to be rotated, resized or cropped, in order to match the CRP. When one or more of these transformations are detected, this is clearly specified in the output. In the case of cropping, the matching sub-region of the CRP is also indicated, thus allowing users to understand which side of the image is missing. In the next post, we will share results of extensive tests carried out with the implementation of Authenticate’s Camera Identification.